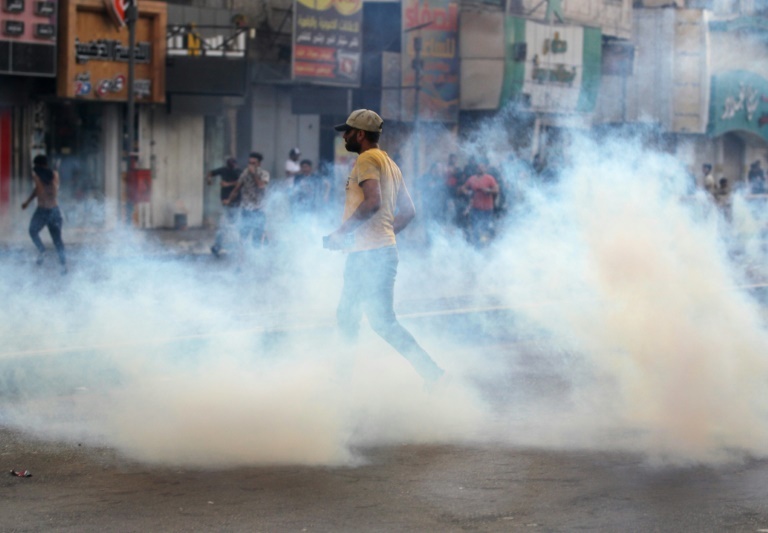 A man was killed Friday in a new day of protests in Iraq, a medical source said, as authorities struggle to contain social unrest which has reached the capital Baghdad. The latest death brings to nine the number of people killed in protests as Iraqis hit out at a litany of social and economic woes. The man killed was aged around 20 and died after being shot in the southern city of Diwaniyah, a medical source said, as hundreds of people gathered outside the local headquarters of an armed group. Shots were fired by a guard from the powerful Iranian-backed Badr organisation, the source added, asking not to be name. The unrest erupted in Basra province on July 8 when security forces opened fire, killing one person as protesters demanded jobs and basic services. Others killed during this month's protests were shot by unknown assailants. The Iraqi government has swiftly denounced "vandals" it accuses of infiltrating the protests. Earlier this week, authorities said more than 260 security personnel had been wounded in ongoing clashes. As southern Iraqis continued to rally against corruption, unemployment, high prices, power cuts and a lack of clean water, demonstrators also rallied in the capital Baghdad on Friday. "We believed that these politicians would improve the situation in the country, but they aren't doing anything," said Yahya Hasnawi, 50, one of thousands of protesters in Baghdad. The crowds were dispersed by water canon and tear gas as they headed towards the fortified Green Zone, a high-security area of Baghdad where the government is headquartered. "We don't have electricity, nor work, the water is frequently cut for hours, the same with the internet," said 19-year-old Mortada Mohammed, in Baghdad's Tahrir Square. Social media has been unavailable for nearly a week and the internet was cut for two days from Saturday, which authorities claimed was due to maintenance work. Protests were held across the south on Friday, the Muslim day of rest when traditionally demonstrations are organised after weekly prayers, and a number of political party offices and public buildings were torched. In oil-rich Basra, people shouted slogans against the authorities as thousands gathered peacefully outside government headquarters. Shouting "no to corruption", hundreds of people rallied in Nasiriyah, 160 kilometres (100 miles) northwest of Basra, chanting the anti-graft message which has characterised nearly two weeks of protests. Demonstrators also surrounded the home of Nasiriyah's governor where security forces responded with tear gas. Protesters called for the electricity minister to be sacked, as the majority of Iraqi homes continue to be struck by hours-long cuts with temperatures this month hitting 50 degrees Celsius (122 Fahrenheit). Earlier on Friday the electricity ministry announced neighbouring Kuwait would supply 30,000 cubic metres of diesel to boost Iraq's electricity supply, the first in a series of such deliveries expected over coming days. Iraqis have held weekly anti-graft protests in the capital since 2015, organised by supporters of an alliance between nationalist Shiite cleric Moqtada Sadr and communists. Sadr topped the polls in May elections but a new government has yet to be formed, as a partial recount of the parliamentary vote has been ordered following fraud allegations. 0 Response to "One dead as new protests shake south Iraq, reach Baghdad"